Hi guys! Not many knows this but my daughter had surgery last week. It was a scheduled surgery (a very much needed one) that was supposed to be a very “easy” one. She has a VP shunt (read about it on wikipedia HERE) and sometimes it malfunctions due to a number of reasons. To make the long story short, this is her 7th shunt revision. And you’d think everything will be easy and routine and this time I was reminded that despite the surgery being routine, there is still a number of issues that can go wrong. Well, she stopped breathing for a bit while at the recovery room and I was reminded how precious life is. I’m happy to say that she survived that episode and that she’s home, safe, healthy and happy. 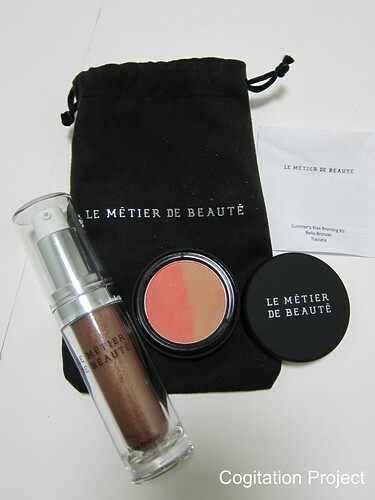 To celebrate, I would like to hold my very first blog giveaway and I am giving away a product from one of my favorite beauty brand, Le Metier de Beaute. Up for grabs is the wonderful Summer’s Kiss Bronzing Kit. I got it as a gift with purchase from the Camp Gorgeous event at Neiman Marcus held last week. It includes the Bella Bronzer in a new packaging and a mini Blushing Bronzed Duet in Traviata. It is a duo consisting of Echo Radiance Rouge and Sun Kissed Bronzer. I am a fan of both especially the Bella Bronzer. I was under the assumption that it will make you dark but this is different. Mixed with Peau Vierge tinted treatment, it imbibes a healthy glow very appropriate for the impending summer season. Giveaway ends at 12:01am on June 27, 2012 PST. You have to do all four steps to be eligible. If you’re missing a step your entry is disqualified. I got the product for the giveaway as a gift with purchase. Although it has a monetary equivalent, it cannot be exchanged for cash or any other product. Winner(s) will be contacted by email within 48 hours after the giveaway ends. Contest open internationally. I will make sure that it gets packed properly and will send it via UPS. If it gets damaged and/or lost in transit to you, I cannot guarantee that I can replace it. If you have any additional questions – feel free to send me an email at nuts4pilinuts(at)gmail(dot)com. Hope you join and good luck! omg I want this! thanks so much!! Thank you so much for this opportunity, the blushing bronzed duet really caught my eyes! hi, best wishes to your daugher. This is a great giveaway. Amazing products …err, let me say beauties! Thanks for passing by my blog and leaving a comment! I hope your daughter is better already. It’s true that life is too precious and fragile. I’m glad to have discovered your blog! Thanks for the giveaway! I’ve always wanted to try something from LMdB, so it’d be SOOOO cool if I could win!